Dynamite's Issue five of A Game of Thrones delves deeper into the thick of things with the stories of Sansa Stark, Lady Catelyn Stark, Lord Eddard Stark, and Bran Stark. We learn of Sansa's extreme dislike for her sister Arya coupled with her enamorment for her betrothed Prince Joffrey. When it comes down to it though will she choose blood over love? Lady Catelyn Stark discovers that secrets travel quickly in the Nine Kingdoms when her news reaches King's Landing even before her ship does. Could someone on the council know the true purpose behind the attack on Bran's life? Lord Eddard Stark finds he is standing upon a knife-edge, caught somewhere between Robert his friend and Robert his King. Can he trust both men, or is one more susceptible to the manipulations of Queen Cersei over the other? While Brandon Stark learns his real purpose since his fall and finally awakens. Still what does it all mean when he learns to fly? Daniel Abraham's adaptation takes us on journey deeper into the characters that play this dangerous game. The story line follows the book by George R.R. Martin as opposed to the HBO series, which I am perfectly fine with. 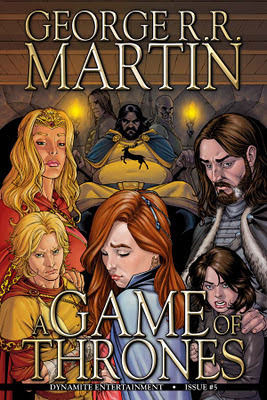 I had to admit when I first started reading this comic I was worried about the lengthy book chapters of A Song of Ice and Fire being converted down to just a few short pages and still successfully carry the story. I must say, Abraham, is doing it very well. The artwork, done by Tommy Patterson, is a little cartoony for my tastes. I'm also a little weirded out that Lady Catelyn and Queen Cersei look to be in their twenties as opposed to women with children in their teens. Sansa and Arya look to be in their late teens as opposed to the beginning of their teen years. Meanwhile the men all look the age they should, granted much hairier and burlier. It's not a complete turn off for me, I just would have preferred something a bit more life-like. 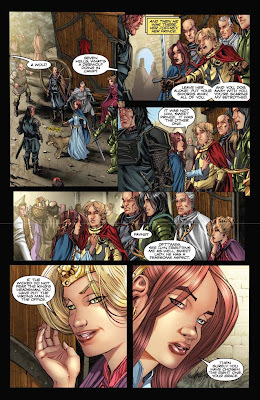 My opinions aside the art is fantastic and marries up very well with the story so far. I highly recommend this series to any one.